Susan is a woman of varied talents and exemplary accomplishments. Mrs. Botek Co-owns Bow Tech. Productions, Inc., and has produced shows in Northwest Ohio for Jerry Lewis, Ray Charles, Davy Jones from The Monkees, Survivor, and Rare Earth, along with numerous other talents. Pageant productions include Beauties of America national pageant and Mrs., Miss & Miss Teen Illinois 2006 and of course the Ohio Pageants since 1991. Mrs. Botek is the President and Founder of the "Light The Way" 501 (c) (3) Breast Cancer Foundation and is a past member of the Lourdes College Board of Trustees where she served on the Executive Committee as Chair for the Institutional Advancement Committee. Under her guidance the Ohio USA/International Pageant System has achieved fifteen top ten recipients, including four top five finalists and two national winners, Lisa Moser, Mrs. International 1998 and Britany Belczak, Miss Teen International 2004. 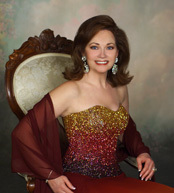 Mrs. Botek received the 2001 Mrs. International Director of the Year and the 2004 Miss Teen International Director of the Year awards. Former Ohio Governor George Voinovich and three Toledo Mayors have recognized Susan for her commitment to her community. She is the recipient a 2001 City of Toledo Spirit Award , a "Twenty Under 40 Leadership Award"; was an honorary chairperson for the "Winner's Track". Mrs. Botek was given the rare "Award of Courage" by the Northwest Ohio Unit of the American Cancer Society and was named their Honorary Chairperson for Breast Cancer Awareness Month where she represented them in both television and radio commercials. She has been a "Survivor Speaker" for Check It Out and was named one of Toledo 's Women of the Year. Mrs. Botek was the co-host for numerous Easter Seal Telethons, a guest host for " Toledo 11 - This Morning" and Town Talk. She has appeared on all major network affiliates in Northwest Ohio , speaking on topics of breast cancer survival, adoption and Pageantry. Next Page - Including Photos from behind the scenes!